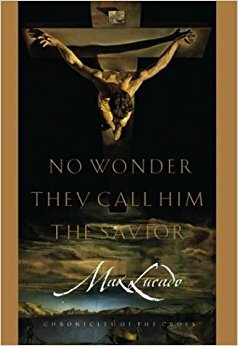 I unearthed Max Lucado’s 1986 book to read during Lent because I’ve been craving the story of the cross. In recent years I researched contemplative prayer and doctrinal differences between denominations. I read a lot about how social/cultural matters intersect with faith and action. I was on the up-and-up, trying to discern where I stood. But this season, I craved the bare bones. The bottom line. The original story. Re-reading No Wonder They Call Him the Savior was a good decision, not only because it served as a time machine to remember who I was almost 20 years ago when I first read it, but it reminded me who I am in Christ today. If you’ve read Max Lucado before, then you know he writes in anecdotes. His books work perfectly as daily devotionals if you want nuggets of insight each day rather than an intensive, lengthy study. In this one, he breaks down the passion story, the road to the cross, the crucifixion, the aftermath, and what we’re gifted because of it. He spends time on specific disciples, such as John, Peter, and Thomas, and he spotlights the glories of grace, redemption, and contentment. Despite its lack of cross-referencing and dips into alternative theological thought, it’s still a solid work because it goes straight to the heart of why the cross matters. Our body of faith relies on it. Our hope depends on it. If the passion story didn’t happen, then all of this is meaningless. The next time you are called to suffer, pay attention. It may be the closest you’ll ever get to God. Watch closely. It could very well be that the hand that extends itself to lead you out of the fog is a pierced one. Buy No Wonder They Call Him the Savior here.